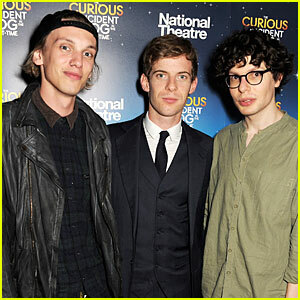 Andrew Garfield and Keira Knightley stepped out to support their friend, director Simon Amstell! The actors hit the red carpet at the premiere of Simon‘s film Benjamin during the BFI London Film Festival on Friday (October 19) in London, England. They were joined at the event by the film’s cast including Colin Morgan, Phénix Brossard and Joel Fry. The film follows a rising young filmmaker who is thrown into emotional turmoil by a burgeoning romance and the upcoming premiere of his second feature. Benjamin is now in theaters. Jamie Campbell Bower keeps it cool with a backwards hat while attending the after party for A Curious Night at the Theatre held at Century Club on Monday (July 1) in London, England. The 24-year-old English actor was seen posing with Luke Treadaway and Simon Amstell. A Curious Night at the Theatre is a charity gala to raise funds for Ambitious about Autism and The National Autistic Society. Last week, Jamie was spotted attending a Mortal Instruments: City of Bones presentation in Spain.